We begin Republican convention week with a bit of a formality. Donald Trump tweeted that Mike Pence was officially his running mate choice on Friday afternoon and confirmed it with a joint appearance on Saturday. Due to its timing the unveiling of Pence probably lacked the dramatic effect Trump would’ve wanted. But Trump’s tone has become decidedly more serious of late. After firing Corey Lewandowski as his campaign manager last month, Trump has looked a lot more like a “conventional” politician ever since. Choosing Pence was definitely a continuation of the trend. Pence was probably the safest choice on Trump’s VP short list and true to Trump’s words, will likely unify the party in a way that neither Chris Christie nor Newt Gingrich could have accomplished. Perhaps as a means to distract from Trump’s official announcement, the media and #NeverTrumpers are making hay over a report the nominee was considering changing his mind on Pence up until the 11th hour. Jason Devaney of Newsmax writes, “Reports say Donald Trump had second thoughts about selecting Gov. Mike Pence for his running mate, but decided to stick with the choice. This “Trump was about to change his mind” brouhaha is much ado about nothing. Think about it. The Nice terrorist attack had just happened earlier that evening. VP runner-up Newt Gingrich immediately went on Fox News and not only strongly condemned what’s going on all over Europe, he one-upped Trump in his approach to dealing with radical Muslims. Newt not only talked about a ban on Muslim immigration, he proposed to deport any Muslim in this country already who believes in Sharia law. Whatever you might think of the merits of Gingrich’s idea, it’s a thought-provoking notion. On the spur of the moment, Trump probably admired Gingrich’s get-tough, no nonsense tone and just wanted an opportunity to potentially change his mind since an official announcement hadn’t yet been made. In essence, Trump was keeping his options open. As a lifelong skilled negotiator, he instinctively knows how to keep the opposition off balance. In this case, it’s the media. Just because Trump may have been making calls at midnight wondering whether he still had the avenue open to change his mind on naming Pence doesn’t mean anything. I was impressed by Gingrich’s arguments too. The thought occurred to me Trump might be thinking the same thing. Regardless of midnight phone calls, Mike Pence is now Trump’s nominee. On balance, it looks like a good move. We’ll see how it plays out at the convention this week. As reaction to Donald Trump’s choosing Mike Pence to be his running mate flows in, conservatives are generally positive on the move, establishmentarians like Paul Ryan are happy too (because they know Pence from his days in Congress) and moderates and liberals are complaining about Pence being too Christian and a known social conservative. Even notoriously skeptical conservative radio host Mark Levin (who is also a #NeverTrumper) was pleased with the move. Yet a good many conservatives are still wary of Pence because he hasn’t acted as a principled, limited government advocate as governor the way he did in Congress before he left in 2012. Jake Sherman and John Bresnahan of Politico report on Pence’s ideological makeup, “It'd be a stretch to call Mike Pence the attack dog Donald Trump said he wanted. But the Indiana governor, Trump’s choice for vice president, definitely had a flair for the dramatic during his dozen years in the House of Representatives, using the kind of soaring — and at times searing — rhetoric he honed as a talk radio host. The journalists note Pence was also in favor of free trade and voted for the Iraq invasion while in Congress to make it sound like the Indiana governor and the Republican nominee are ideological opposites. The media would probably make the same argument about any of the Republicans Trump could have picked, because The Donald has been somewhat of a philosophical chameleon throughout his life in terms of favoring different policies at various periods of time. It doesn’t really matter what either man preferred in the past…at least not in this election. Both of them seem to be on the same page now and I’m sure Pence will be more than happy to share his opinions with the nominee in trying to steer Trump in the proper direction moving forward. But make no mistake; Trump is still the man in charge. In that sense, Pence will be no more than perhaps Trump’s top advisor, a role I’m guessing is acceptable to both men. Many conservatives are suspicious of Pence’s questionable willingness to fight for the conservative cause after his cave-in to the homosexual and business lobbies last year when as governor he demanded changes to a religious freedom bill he’d already signed. Principled conservatives should feel compromised by Pence’s actions in that instance as well as other similar betrayals on disastrously bloated big government measures such as Common Core and accepting Obamacare money during his time back home in Indiana. But here’s why I think Pence will go back to his old pre-governorship conservative self as Trump’s vice president. His lukewarm performance as governor could be attributed to what Pence sees as different roles between the state and federal governments. Constitutionally speaking, the Founding Fathers felt the most effective government was the one closest to the people, so they purposely designed a federal government that would defer to the more localized laws of the states in matters of little import to the national government (theoretically, this is supposed to include marriage laws and bathroom usage). That way, representatives and governors are more directly accountable to the demands of the People. Pence was known as a limited government conservative in Congress and felt comfortable fulfilling that role in the national body because it’s what a federal representative is supposed to do (i.e., preserve power for the states). As a member of the House of Representatives, Pence likely felt it was not only his job but his duty to ensure most decision making authority was kept at the state level -- at home in his district – hence, his staunch opposition to expanding the size and power of the federal government. Once Pence returned to Indiana, however, he was pressured by any number of local groups to tailor policy to their needs. These are people Pence likely knew from way back, business interests and friends who pushed him to save jobs in his home state by giving in to public calls to change the law. When you are governor and you’ve got huge companies threatening to leave the state and take thousands of jobs with them, you take it seriously. Business holds every governor hostage in such manner…such is life in twenty-first century America. Big business hears the word “boycott” and they panic. Leftists know it and threaten it often. Should Pence have given in to them and compromised religious liberty? No. But it’s hard for us to judge living hundreds if not thousands of miles away from Indiana. If we’re truly going to honor the Constitution as it was meant to be, we should be willing to give deference to governors and representatives to decide what’s best for their own states. Therefore, just because Mike Pence might have felt the religious liberty provisions needed to be softened in Indiana doesn’t necessarily mean he’ll act similarly at the federal level. If Pence envisions a weaker and more deferential federal government (as he seems to believe), it will be easy for him to fight attempts by Trump or the Democrats to expand its power. We all know the federal government has expanded by leaps and bounds under the big government presidencies of George H.W. Bush, Bill Clinton, George W. Bush and especially Barack Obama. Every conservative believes the federal government needs to be rolled back in favor of states being granted the leeway to decide policy for themselves. 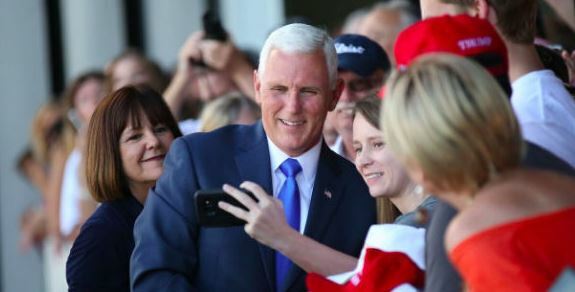 I personally don’t believe Mike Pence will have any problem with that notion and that’s why I think he’ll be an effective conservative in returning to Washington – much more so than he was in Indianapolis as governor. Call me naïve, but I actually thought the naming of Mike Pence as Donald Trump’s running mate would at least bring some sort of kind words (like Mark Levin’s above) or possibly even a peace offering from the #NeverTrump movement, but no such luck was to be had. In a piece titled “Never Trump: Not Ready To Make Nice!”, Jason Taylor of The Resurgent writes, “If this isn’t enough to push the widely known public faces that advocate Never Trump out of the neutral zone and into the fighting corner of either Governor Johnson or Secretary Clinton, nothing is. So it’s time to fish or cut bait gang: is Never Trump a movement to defend and promote conservatism, or a meme to garner clicks and ratings? “And to think Sarah Palin will not be there to share her ‘insights.’ Viewers will see the GOP continue to implode right before their eyes at ‘the mistake by the lake,’ stay tuned! I actually think the ones who will be laughing are those in wild celebration when Trump wins in November and the Supreme Court is saved from utter ruin. It’s funny how #NeverTrump – or some of them, at least – now is resorting to insulting Sarah Palin (and Cleveland) to accompany their continued attempts to beg people not to participate in this year’s election. The fact Trump will complete his journey to the nomination this week doesn’t seem to have begun the process of melting #NeverTrump’s icy hearts. The bitterness they’ve expressed for months isn’t going away and no matter how many times you extend a hand to them, they just hold up one finger in reply to your gesture. If some of them don’t feel the way Taylor does – that #NeverTrumpers should actually consider Hillary of abortion- approving, pot smoking advocate Gary Johnson in this election – those people need to speak up now. I honestly believe “never” didn’t mean never in the beginning of the movement in March. The #NeverTrumpers were merely using the threat of not supporting Trump as a tactic to try and defeat him in the primaries. It didn’t work, folks. Unfortunately, many of them feel stuck with the label and won’t retreat, determined to go down as martyrs to an undefined, futile cause. And basically take the country down with them in the process. If some elements of #NeverTrump are truly “With Her,” it says a lot more about them than it does about those of us who’ve made our choice in the two-person contest. One of the candidates is a corrupted lifelong liar who believes in totalitarian government to force people to conform to whatever the Left commands. The other is an imperfect human being who is demonstrating on an almost daily basis a willingness to listen and learn. With the Bernie bros bailing on Hillary in droves, where’s the #NeverHillary coverage? Finally today, the media and #NeverTrumpers are going to do all they can this week to convince Americans that the Republican Party is hopelessly divided and torn over the formal elevation of Donald Trump as the GOP nominee for president. Don’t be fooled. If anything, the Democrats are in much worse shape. Paul Bedard of the Washington Examiner reports, “Supporters of rebel Democrat Sen. Bernie Sanders are not following his lead in backing Hillary Rodham Clinton, detouring away from the establishment Democrat to other candidates including Donald Trump. Before the FBI announcement, 53 percent of Sanders voters said they’d vote for Clinton. Now, only 41 percent said they would and 14 percent indicated they’d pull the lever for Trump. I’m guessing the drop in support for Clinton from Sanders backers is mostly attributable to the youth of his primary constituency. These would likely be the most impressionable voters who would be turned off by Crooked Hillary’s gaming of the system to avoid punishment. Sanders didn’t spare criticism of Hillary’s close relationship to Wall Street and powerful interests during the primaries. Now a lot of that Sanders’ finger-pointing is looking pretty accurate right about now. The question is how many of these people will eventually come back to Hillary by November? Certainly some of them will. But for now, where is the media coverage concerning all the troubles Hillary is having in consolidating Democrat support? I think #NeverHillary has a pretty good ring to it.